Get healthy and plump lips with Mamaearth's 100% natural lip care balm! Enriched with cocoa butter and chocolate, this 100% natural lip balm softens and hydrates your lips and helps you achieve the perfect pout! Formulated using natural beeswax, this balm moisturizes your lips naturally. 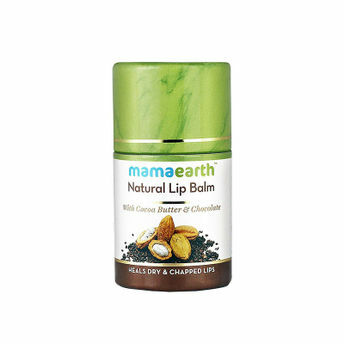 Cocoa butter in it nourishes and protects dry, chapped and cracked lips. Shea butter with coconut oil provides extra moisture and nutrients that the lips need to heal. 100% natural and dermatologically tested, this unisex lip balm is completely free from petrolatum, paraben, silicones, artificial flavour and colour. Chocolate: Chocolate helps condition, moisturise, repair and protect lips, along with giving a delicious edible flavour to the lip balm.